The executive committee of Samford University’s board of trustees adopted a new campus master plan during its winter meeting Feb. 28. The full board had given approval to the master plan concept in December, but the final 300-plus page report was presented to the executive committee for final approval. University officials said the plan features four phases that align with the university’s strategic plan, and address needs in a “long-term, fiscally appropriate and responsible way” over a 10–20-year implementation. Phase one, which is already underway, includes new residence facilities to accommodate expected growth, renovation of existing academic space for Howard College of Arts and Sciences and the School of the Arts, and centralized relocation of admission and other student services offices. Phase two includes enhanced teaching and learning spaces, renovations to the university center and other academic spaces, and additional parking. Phase three includes potential expansion of College of Health Sciences facilities, and additional residential space and parking to accommodate expected enrollment growth. Phase four and independent projects might include renovations to student recreation and fitness facilities, athletics facilities, the fine arts center, and additional housing and parking. Trustees also approved new faculty in law, and health informatics and information management. Twenty-five faculty were reappointed to endowed chairs and professorships. Trustees heard an update on the university infrastructure improvement project in partnership with Johnson Controls Inc. Construction is underway on a chiller plant renovation that will be completed later in the spring. Other projects and sustainability initiatives are ongoing. 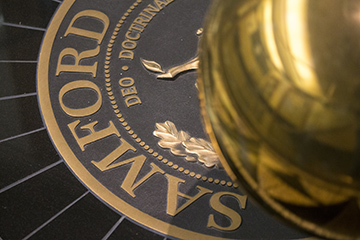 Athletics reported to trustees that Samford was the only NCAA Division I institution in the country whose football, women’s soccer and women’s volleyball teams all qualified for NCAA postseason play. The next meeting of the board of trustees is May 2.